In Part 1 of the Hard Finishing of Gears, we introduced the concept and a brief history of processes used to achieve non-hardened finished parts. Continuing, consider a gear that has been pre- or semi-finished, meaning additional (“plus”) material has been left on the flanks of each gear tooth and, in some cases, in the root area as well. After this part has been heat treated, it must undergo hard finishing, which removes a small amount of stock to arrive at the final, geometrically accurate profile, lead, and spacing. Gear manufacturers today use a variety of finishing processes for this purpose (see Figure 1). Contemporary CNC gear hobbing machines often have the capability for carbide rehobbing. Put simply, this operation is a carbide re-hobbing process for hardened gears that accurately removes stock from both flanks of gear teeth. This is achieved via synchronous timing between the work and cutter spindles after orienting the work piece. (For more information on this process, see our previous article.) Carbide rehobbing, sometimes called “skiving,” removes errors such as cumulative pitch, which cannot be achieved with tool-driven finishing methods such as those discussed in Part 1. Generally speaking, carbide rehobbing can achieve AGMA Q8 – Q11 quality, which is limited by the generating process of hobbing and the number of gashes of the hob. “Skiving” can be an ambiguous term. Along with “scudding” and “power skiving,” the term can refer to a process that uses a disc-like cutter and work in a crossed-axis relationship. This allows continuous generation for both internal and external gears. For internal gears where the hobbing process is not practical, this skiving process offers significant speed advantages compared to traditional shaping. It is mentioned here because there are machines available that use this process to finish a hardened gear. To achieve even greater quality, a gear manufacturer must turn to finishing processes with an undefined cutting edge. Grinding serves this purpose, where the “cut” is made by each grain of a grinding wheel instead of a defined tooth. Form grinding, also called profile grinding, where the tool takes the conjugate shape of the work piece, is a process where each tooth space is ground individually. It can be used for both internal and external gears. Generating grinding is akin to hobbing in that the tool takes the shape of a worm that mates with the work piece. A timed relationship between the work and grinding spindles allows accurate stock removal from the hardened gear. Grinding can achieve AGMA Q12 – Q15 quality, but this process requires special machinery designed around the process, tools, and work pieces. Honing is an alternate hard finishing process that uses an abrasive tool with an undefined cutting edge like traditional grinding. This process uses a dressable wheel (also called a ring or stone) that meshes with and envelopes the work piece. Designed to be in a cross-axis relationship, the work piece is put under pressure from the honing wheel. Once these two components turn in mesh, a sliding, shaving action removes material. 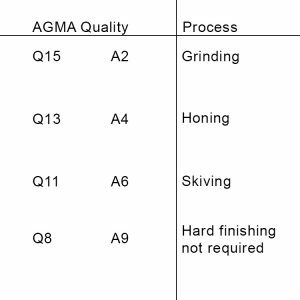 This process can achieve AGMA Q10 – Q13 quality. Finally, the gear manufacturing industry will soon see more options for “superfinishing.” Whereas hard finishing processes remove hardened stock material to arrive at a finished gear geometry, superfinishing focuses on achieving better surface finish quality. For example, in a polishing process, a gear manufacturer may use a continuous generating wheel of a unique material to improve gear teeth surfaces to mirror-like finishes. The AGMA does not currently specify standards for surface finish. The hard finishing of gears has become a common process for gear manufacturers. Hardening gears increases life and resistance to handling damage, but the heat treating distorts tooth geometry. Thus, pre-finishing processes typically leave stock material along tooth flanks, and hard finishing processes remove this material after heat treatment to achieve a geometrically accurate tooth. Finally, concurrent or subsequent superfinishing processes may also increase surface finish quality.